To say the political and legislative worlds in the U.S. have been a bit chaotic lately may be the understatement of a lifetime. While we’re not quite in the upside down just yet, laws and restrictions in the past few years have been flipped, and drones are one particular piece of tech benefiting from it. For example, hobbyists no longer need to legally register their drones, and the current administration is easing the commercial side too. This comes at a time when there is still a great deal of hesitancy in allowing your average consumer to touch a drone, and even more so for commercial solutions. For years we’ve heard about the potential for Amazon and food delivery services’ interest in using drones, but regulations prevent them from progressing outside of the testing stage. Even for news broadcasters, they have been limited to flying a drone near spectators, and it wasn’t until earlier this month that CNN received the first waiver to fly over people. Although there are new regulations on the way for U.S. cities, these are the current ways people are making money using their non-toy level drones. Of course before you jump right in, know that you must complete several steps and receive a Part 107 Waiver from the FAA, which recently replaced the previous section 333 exemption rules. And for those of you hoping to become drone delivery couriers, that’s unfortunately just out of reach. Photography and videography are not only the most logical options for making money with your drone, but thanks to the onboard technology and hardware pricing it’s becoming easier than ever. 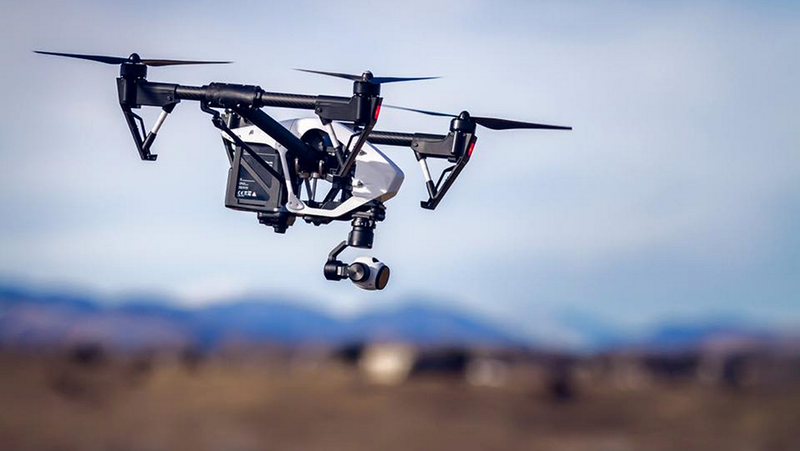 The latest drones, whether they be the likes of DJI’s portable Mavic, the Phantom line, or even the more professional lines from Yuneec, all have high quality cameras and film in 4K resolution. That being said the more important factors are now flight time, range of motion, frames per second, and of course stability. So what kind of basic photography or videography can a drone pilot begin to build their portfolio on? Weddings, real estate, sporting events, news footage, film or TV footage, and of course selling aerial footage. However, just like with a DSLR, simply owning an expensive camera doesn’t mean you’re magically a photographer or videographer. Both of these are an art form, so get some practice before you start selling your services. The last thing you want to do is have an angry newlywed couple tossing you a one star Yelp review. In an area like mine (Charleston), neighborhoods are practically springing up like weeds. One component to taking out forested or otherwise unsettled parts of land is for construction companies to properly survey the area first. While standard drones can certainly assist with photography in this area, it takes slightly more sophisticated equipment. More specifically, both photogrammetry and Lidar devices are mounted onto a drone and flown over an area in an effort to survey the land. For the drone operator this can result in a nice paycheck, and for the construction company this also saves them from hiring a traditional aircraft to conduct a land survey. Perhaps not your standard gig, there are a few examples of where drones have supported search and rescue teams. Take for example a hobbyist who helped a family in Wisconsin find an elderly family member with Alzheimers who went missing for three days. In about 20 minutes the drone spotted Guillermo DeVenecia, who was in generally good health considering the circumstances. At the time drones were prohibited from any commercial use; However, legislation has been slowly improving since that time. In cases of wildfire in recent months, there have been both negative and positive scenarios involving drones for support, including the use of thermal imaging. Perhaps one of the largest areas of growth when it comes to drone piloting is tied to farming. Sure, crop dusting has been going for decades, and famers are shifting to more automated equipment, but the ability to check areas of crops from the sky with the help of thermal imaging can prevent a great deal of loss in the long run. Special agriculture focused drones can collect information on soil temperature, H20 levels, plant counts, and basic 3D mapping. More than land surveying, there are plenty of reasons a drone operator may be of use for construction and public works. Let’s say there is a blockage at your local water treatment facility, rather than having someone stand over the facilities, instead use a drone to check for issues. The same goes for construction. Not only can a drone operator capture progress through photos and video, they can also monitor any issues and give perspectives that people simply can’t reach on their own. Now if only they could add a windshield wiper and squeegee on it for window washing skyscrapers. Wildlife guides, even fishing charters, can all benefit from drones. However, there are plenty of regulations around when someone can hunt and where. This in turn leaves an opening for both law enforcement and contractors to help catch people running outside of the law. The same goes for people illegally burning or starting fires when they shouldn’t be. Before you go trying to seek out wildlife on your own, keep in mind that it’s illegal to fly a drone in all federal national parks, and many state or local parks also have their own restrictions. On the positive side though there are plenty of fishing charters that will take you out to sea in an effort to get your new Tinder profile (catching and holding a large fish). A drone pilot not only can spot where there are large fish breaching the water or near the surface, but if rigged up, it can drop your line right over them. If it’s big enough for TV, you know there is money to be made. Drone Racing has been an underground sport for years, but in the past year it’s become mainstream enough where it found a home on ESPN. This year’s champion walked away with $100,000 in prize money. In the U.S., law enforcement is slow to adopt and also gain the necessary legal rights to fly drones. This is where licensed private investigators can tap into it this area to some degree. When using a drone’s onboard camera, you can easily stream to your mobile device a live feed of the surrounding area. If you were to use a drone, while still remaining the line of sight and get an overhead view of someone’s property, a PI could use this to gain some tactical advantages. Is it common? Not really, however, it is not unimaginable to think your public hookup session could easily be captured from a drone.